The CrossFit Workshop: Jump Rope is a hands-on, fast-paced, fun seminar at which participants learn how to use a simple and effective tool to energize their programming and workouts. The workshop features longtime CrossFit proponent and 1992 U.S. Olympian Buddy Lee, who is widely recognized as one of the world’s foremost jump-rope authorities. Participants will leave the workshop with clear paths to elusive jump-rope skills such as double-unders, triple-unders and more. Use optimal biomechanics for jump-rope mastery. Properly set up jump-rope equipment. Correctly adjust the jump rope for optimal results. Use progressions that form the base of jump-rope techniques: basic jumping, speed jumping, power jumping (double-/triple-unders). Use visualization, imagery, breathing and relaxation techniques in combination with dynamic jump-rope path patterns (forward, backward, sideways, crossover, infinity). Program various jump-rope techniques into CrossFit workouts—beyond single-/double-/triple-unders. The default language for this course is English. Any courses with a translator are specified in the "Language" section from the event registration link. Upon successful completion of this course, a Certified CrossFit Trainer may claim seven CEUs toward his or her continuing education. Email sme@crossfit.com for discounts for active duty or retired military personnel (upon 20 years of service or permanent medical retirement) and first responders. Link to the Seminar Guide provided in confirmation email upon course registration. Seminar Guide (sent with course confirmation email). Suitable clothes and shoes for working out and coaching. Food and fluids, including a meal if you do not plan on going off-site during the lunch break. An Introductory Jump Rope, suitable for learning technique, will be provided at the course. 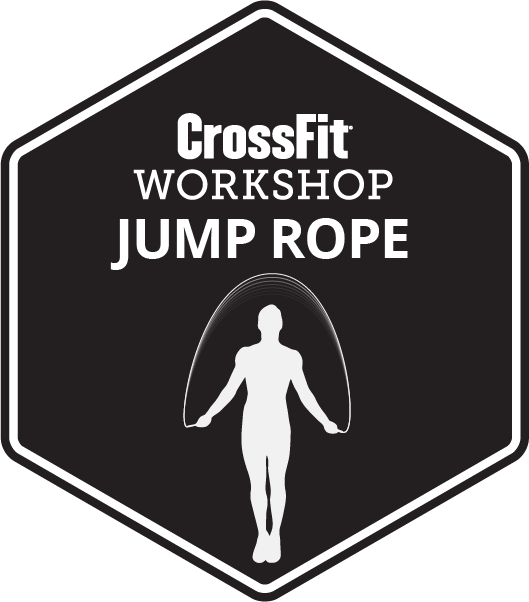 Those who attend the CrossFit Workshop: Jump Rope receive a Certificate of Attendance. Please arrive at 8:00 a.m. to check in. The "CrossFitter 5, 10, 15"